Pint of Science returns for its second year in Australia, and this year’s international festival is bigger and better with science events presented at three Sydney pubs and new teams established in Melbourne, Adelaide and Brisbane. The format is simple: down-to-earth talks by top scientists in the most relaxed setting possible – the pub! The festival aims to showcase the best of local research to the general public. That means you can expect events that are free of jargon, but full of fun! Pint of Science will be running 3 themes: Beautiful Mind (all about the brain), Our Body (all about the body), and Atoms to Galaxies (Physics and Chemistry) – check out the website to see what is coming to your city. With topics such as Sense and Sensibilities, and Bites to Bytes, and a previous TED talk speaker, the festival aims to bring you awesome science stories that will whet your appetite for more. Whether you’re a complete geek or a curious soul, these events will engage you with fascinating stories, discoveries and fun facts to dazzle your mates. The International Pint of Science Festival will run from 18 – 20 May in 40 cities in eight countries. Tickets will be available in late April from the Pint of Science website. We look forward to seeing you there! Dr Caroline McCulley works at the Charles Perkins Centre at the University of Sydney, and is coordinating the Australian branch of the Pint of Science festival in her spare time, with a lot of help from the event teams. 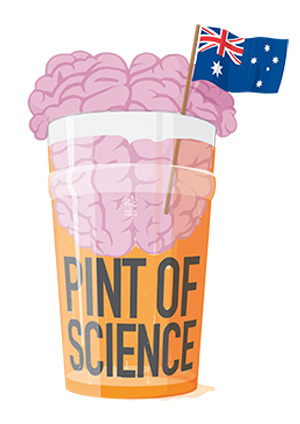 Follow Pint of Science on Twitter @pintofscienceAU or like facebook.com/pintofscienceau.